At the top of Volvic’s hillside, in the heart of the woods growing on the “puy de la bannière”, we can find big rocks. Rock, in the dialect of the Auvergne (the one of Alain Gaudet) is called “Rochaille”. 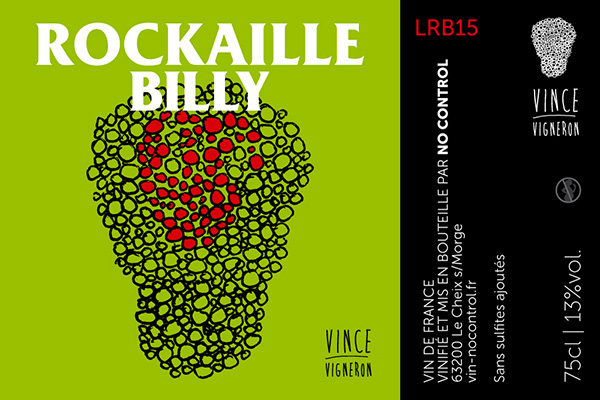 “Rochaille” became “Rockaille” and “Rochaille” evidently became Rockaille Billy. Located in Volvic. Soil : granitic sand. Whole bunches in a fibreglass vat. Grape trampling to make space in the vat, maceration of whole bunches in the juice. 4 punch-downs, devatting, pressing and blending of both vats with the free-run and pressed juice. Maceration of 3 weeks. No added chemical inputs. Half of the wine in a tank, the other half in a 23hl cask.